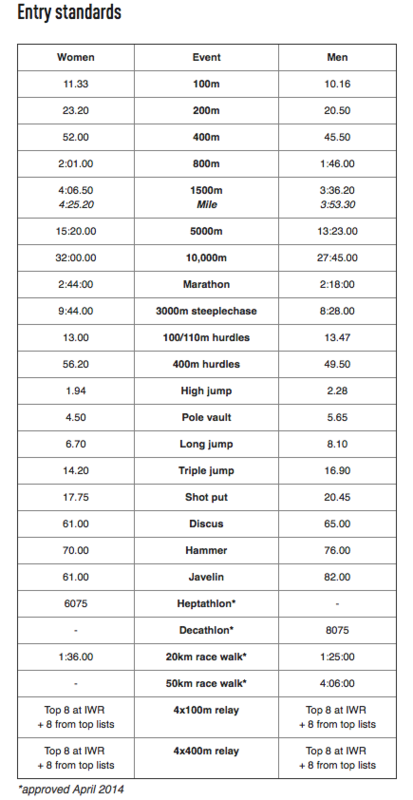 The IAAF has released entry standards for the World Championships, Beijing 2015. I’ve taken the time to look at the changes, go into further detail about who’s already qualified and translate some of their document by committee into concepts and scenarios with the North American track fan in mind. (Yes, I live in Canada and follow the sport up here so I said North American). The qualification period for the 10,000m, marathon, race walks, relays and combined events is from January 1, 2014 to August 10, 2015. The remaining events qualifying window goes from 1 October 1, 2014 to August 10, 2015. Starting for 2015, there is a single qualification standard. Most fall between the ‘A’ and ‘B’ standards from Moscow 2013. Notably, the men’s 5000m is 3 seconds slower than the previous ‘B’ standard. While the women’s 5000m is 4 seconds faster than the previous ‘B’ standard. The women’s 1500m & High Jump are very close to the 2013 ‘A’ standard. The 1500m is 1 second slower and High Jump is 1 centimeter lower. Men’s and women’s marathon are both 1 minute slower than the previous standard. The Mile isn’t all the back, but the folks over at Bring Back The Mile may be happy that the Mile can now serve as an IAAF qualifier for the outdoor 1500m. – Win their area championship (excluding the marathon). Winner of the USA or Canadian Championships. – For the 10,000m it’s pretty straightforward, the top 15 athletes finishing in the senior men’s and women’s races at the IAAF World Cross Country Championships, Guiyang 2015. – The top three in the 2014 men’s and women’s IAAF Combined Events Challenge. Men – Rico Freimuth (Germany), Telco Sintnicolaas (Netherlands), Yordani Garcia (Cuba); Women – Nadine Broersen (Netherlands), Carolin Schafer (Germany), Lilli Schwarzkopf (Germany). – The top three in the 2014 men’s and women’s IAAF World Race Walking Challenge. Men – Ruslan Dmytrenko (Ukraine), Jared Tallent (Australia), Caio Bonfim (Brazil); Women – Hong Liu (China), Eleonora Giorgi (Italy), Aba Cabechinha (Portugal). -Top 10 finishers at the IAAF Gold Label marathons held in the qualification period (January 1, 2014 to August 10, 2015). This is was in place for 2013 in Moscow but I didn’t realize until this year the number of marathoners that have the “entry standard”. The number can be up to 380 men & 380 women. Each country may send 3 or 4 athletes with inclusion the IAAF Diamond League Champion or reigning World Champion in their respective event. If a country has both, they can only designate one as a wild card. For example, Brianna Rollins won the World title in 2013, but Dawn-Harper Nelson won the 2014 Diamond League. The USA can only pick one of the two for the wild card spot. 4. How will being “best ranked” help you get to Beijing? There is also the opportunity for athletes (not in the 5000m, 10,000m, marathon and race walks) to fill open spots based on being a “best ranked” athlete. Not sure I quite grasp what this means. Does this open up an opportunity for Kenyan men to fill up spots in the men’s Steeplechase, if the IAAF is not able to fill up the event? If there is a limit of 3 athletes per country (or 4 with DL Champ or reigning world champ), I am having trouble figuring out how this provisional will apply. Update 11/20/2014: After a night of thought and sleep, it appears this provision will apply when the new standard is met by less athletes than how many the IAAF wants to fill the field. For example, if only 13 women get the new high jump standard and the IAAF wants a field of 20. The IAAF will then look at performance list to select jumpers to fill up the spots. Not sure how often this provision will come into play but could set up some interesting opportunities for athletes that bomb at the national championships but have a high qualifying mark. It’s possible that someone with standard, does not finish in a qualifying spot at their area championships but get’s trip to Beijing under this provision. I guess we’ll have to wait and see. 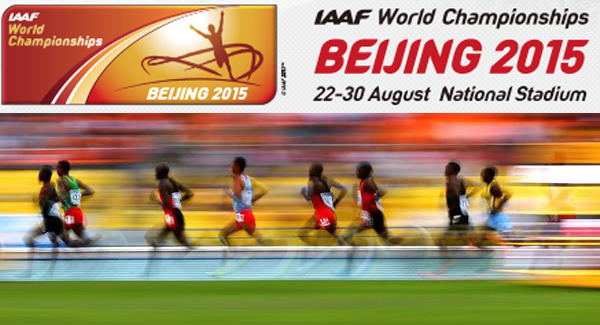 Let us know what you think of the new entry standards for the IAAF World Championships, Beijing 2015 in the comments? And feel free to discuss any interesting scenarios that you think may pop up. Is Area Championships, not something like NACAC as opposed to National Championships? I still don’t think the invited athletes need the qualifying standard. “The IAAF shall then invite the athletes with the next best performances in the respective qualification periods in order to reach the established ideal number of athletes by event”. There is no reference to having to having the standard. Yes if a member federation omits someone with the standard and doesn’t take their full quota that athlete will have a chance of getting invited but it could go down to athletes that don’t have the qualify standard. Who knows what criteria they are using to fill up the numbers.Does the member federation have to take and pay for that athlete to go along? Take the 100m (unlikely as the numbers are likely to be there) and Kim Collins is not being selected by St Kitts and Nevis because they are still in dispute. It would be likely that Collins was high enough ranked to be invited, what does St Kitts and Nevis do? Did you find any place that defined what the Area Championship is? These standards are extremely hard. The smaller countries are now really in trouble. Even the track powers will have problems. For example, if one goes down the world list for 2014, only nine women jumped 6.70 or further in the LJ. For the men, only 13 guys jumped 8.10 or better. I don’t know where the IAAF is going with this, but I already dislike it. What happens when there are 28 athletes on the list who have qualified, a number that have been invited up to 30 and there are 4 athletes remaining at spot number 31, do they all get to go? Example in women high jump the target number is 32, number 30 has jumped 1m93, number 31 has 4 athletes that jumped 1m92, what happens here?